The PFF Foundation Draft: Who would you choose to start a franchise? Imagine the world of football was starting over again, from scratch. If you were starting a franchise from square one, who would you use? What old players are still worthwhile as building blocks? How young is too young? That was the challenge posed to our PFF analysts over the last week. It’s PFF’s first-ever Foundation Draft, imagining that our analysts were each put in charge of one of 32 NFL teams and picking their teams from scratch. The rules: The player pool is made up of the entire world — NFL players, college players, high-schoolers, some talented player’s toddler. Age matters, position matters, but contracts do not. The game will be played just like it always has been. Who went first? How many quarterbacks went off the board? How do you balance immediate production against long-term investment? Those are just some of the questions. Below, you’ll find the whole first round, along with arguments from the analysts making the selections and some overall strategy analysis. The draft has continued, though, and we’ll be back later in the offseason to see how the teams start to form. 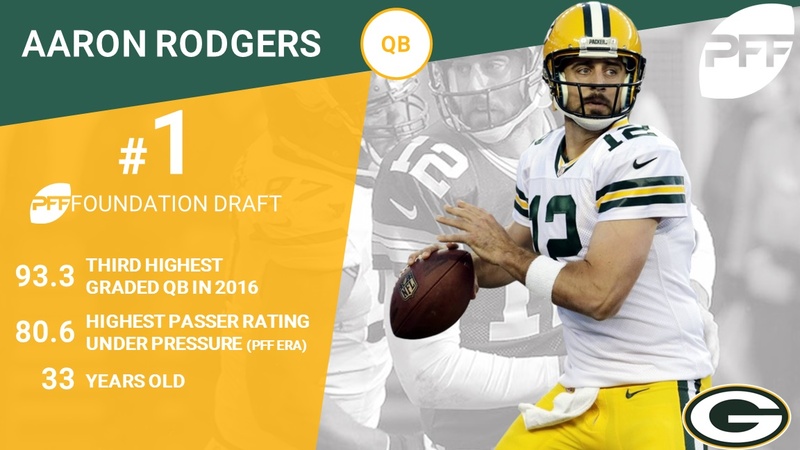 Rodgers might be on the older side of what you’d expect from this draft, but he’s still an elite quarterback, with a top-three PFF grade every year he’s been a starter (2008-present) except for 2015. Considering quarterbacks tend to age as well as any position, going a bit older for a relatively sure thing here makes sense. Through five years of his career, Luck has gone from good, to very good, to alarmingly poor, to among the league’s elite. His grades have gone from 77.4 (2012), to 86.4 (2013), to 88.4 (2014), to 45.1 (2015), to 92.4 (2016). Luck’s career has been marred by a porous Indianapolis offensive line that has led to multiple injuries, but give him a better line (which hopefully this draft would do), and he’s got all-timer potential. Talk about consistency. In his five seasons, Wilson’s average PFF grade has been 90.6, never falling below 86.8. He’s got a Super Bowl title and another championship appearance under his belt despite being a surprise rookie-year starter as a third-round draft pick and standing at only 5-foot-11. This pick might have looked silly after Carr’s 2014 rookie year. He was thrust into a starting role for a middling Raiders team after being picked in the second round and it showed, as Carr managed only 21 touchdowns against 12 interceptions, a passer rating of only 76.6 (25th of 27 qualifiers) and a PFF grade of 47.7. Since then, though, Carr has 60 touchdowns against 19 interceptions over two years, and was an MVP candidate until a late-season injury in 2016. Anyone who says they saw this coming for Prescott even one year ago is outright lying. He was a fourth-round pick for the Cowboys, a project quarterback who could maybe be the eventual replacement for starter Tony Romo if things broke right. Instead, Romo is the thing that broke, as the veteran quarterback missed essentially the entire season to injury, and Prescott took over. The Cowboys had even tried to deal for Josh McCown in the preseason, and did end up adding Mark Sanchez. But Prescott took the starting role and ran with it, finishing the season with an 84.9 grade that was good for 10th in the league and winning offensive rookie of the year. Winston has yet to finish among the uber-elite quarterbacks in PFF grading, finishing with grades of 78.2 and 77.5 over his first two seasons, but it’s hard to find quarterbacks with much more potential. He’s the first quarterback ever to finish with 4,000 passing yards in each of his first two seasons, and he did it with little other than Mike Evans in the way of receiving weapons. Give him more to work with, and his ceiling is crazy high. It seems we’re doomed to religitate the first to picks of the 2015 draft forever, as Winston and Mariota will forever be linked. Mariota had a crazy stretch in the middle of the 2016 season when he looked like a world-beater, with 21 touchdowns against 3 interceptions in Weeks 5-12. Outside of that window, though, Mariota had only 5 touchdown passes against 6 interceptions. He has plenty of potential, but he could stand to improve his consistency. You might expect a quarterback coming off an MVP season and a near-miss of a Super Bowl title to go a little higher than this, but Ryan is 32, and while he’s been an above-average quarterback for most of his career (2009 was his only year with an overall grade under 83.0), he’s also not finished among the position’s elite as often as someone like Rodgers (three years with a grade above 90 — 2012, 2014, 2016). Still, assuming he ages well, taking him here locks down the position for several years. Had we done this draft a year ago, Newton might have been first off the board, and definitely would have been higher than ninth. He was coming off a year as the league MVP, with the second-highest PFF grade and a Super Bowl appearance. But in 2016, Newton put up the lowest grade of his career (79.5, 18th among QBs) and saw his running performance drop off. If he can rebound, this pick is a steal; if that was the beginning of a downturn, this pick might prove to be a mistake pretty fast. This is one that kind of came out of nowhere over several years’ time. His selection in the fourth round was widely mocked, coming three rounds after the team traded a huge haul of resources to select Robert Griffin III in the first. He grew into the starting job in fits and spurts, replacing and being replaced by Griffin and Colt McCoy multiple times. The last two years, though, he’s seized the job, putting up 54 touchdown passes against 23 interceptions over the two years and adding 9 rushing scores. His PFF grade has risen steadily, peaking at 85.9 (eighth at the position) in 2016. Here’s where game theory comes into play. If you said you could have a player at his current level of play forever, Brady likely would have gone first off the board in this draft. If instead you said you could have a blind-resume quarterback who turns 40 in less than a month, he wouldn’t be drafted in a 50-team league. Brady, though, puts wrinkles in all that. His remaining career almost has to be shorter than all those above him on this list, but it could have the highest ceiling in that time. Brees’ dominance at an advanced age for quarterbacks would draw more comment if it weren’t being done in the time of Brady (and Peyton Manning before that). He’s still one of the league’s best signal-callers — his 86.7 PFF grade in 2016 was his lowest of the PFF era (since 2006), which says more about his strong performances prior to 2016 than it does anything negative about his most recent season. Coming on the heels of consecutive quarterbacks who are a combined 77 years old and have a combined 33 years in the league, this is a hard left turn, to a 21-year-old who was only drafted a couple of months ago and is unlikely to see the field in more than a handful of garbage-time situations in 2017. 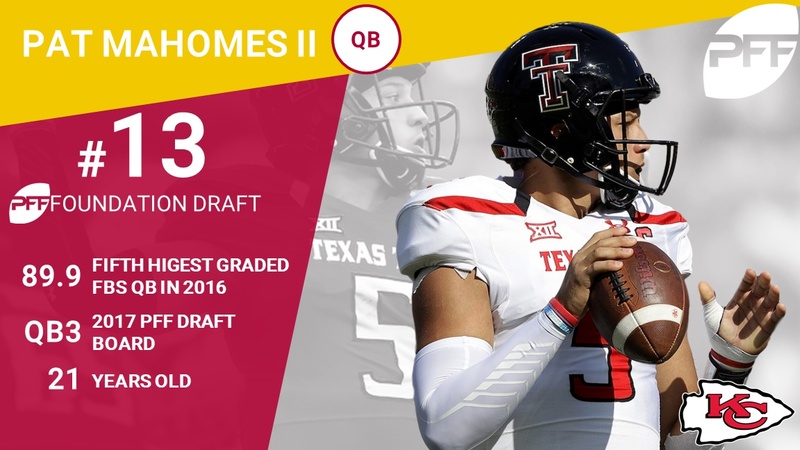 Still, the Chiefs traded up to pair Mahomes with head coach Andy Reid, and if his development goes well, Mahomes has a sky-high ceiling down the road. Considering this is starting a whole new league, odds are Mahomes, taken here, would start in this league, but even with that, this is a pick made by a team building for the future, not necessarily right now. Early in his career, Stafford was mocked for being oft-injured and untrustworthy. That has flipped, to the point that he’s a solid 96-for-96 in games played since the start of the 2011 season. Stafford’s passing performance peaked at 5,038 yards and 41 touchdowns in 2011, and he’s averaged only 4,282 and 26 touchdowns the last three years. Still, he’s fresh off a career-best 85.4 PFF grade and is only 29; he doesn’t really have best-in-the-league potential, but he can be a solid starter for a franchise for a long time. Here we are reaching down into the college ranks, with the pick going to a college quarterback who wasn’t even a starter at the beginning of the 2016 season. 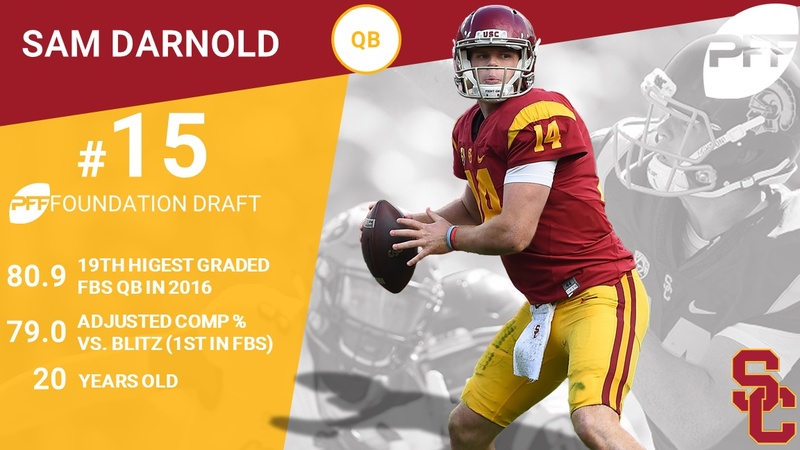 But that’s how strong Darnold’s season was, as he didn’t start until the Trojans’ fourth game and finished the year with 3,086 yards and 31 touchdowns against 9 interceptions. He’s the early favorite to be the first pick in the 2018 NFL Draft, and being able to grab him a year early in our fictional exercise is a sneaky pick. A non-quarterback! With most of the top-tier and high-ceiling quarterbacks off the board, the draft makes a shift to defense here, and the 2016 Defensive Rookie of the Year leads it off. 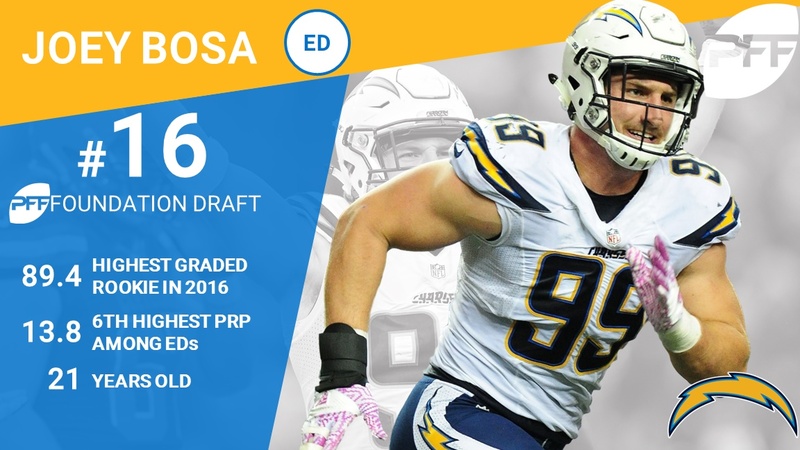 Bosa was something of a revelation in 2016 after missing the first few games of the season. 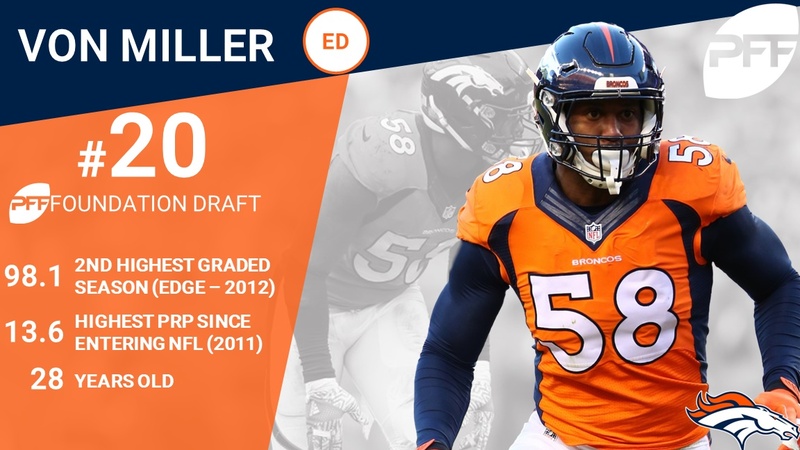 He tallied 59 quarterback pressures in only 12 games as a rookie, tying Von Miller with the most through a player’s first 12 games in the PFF era. We stay on defense and in Los Angeles for the 17th pick, going to Donald, who has been PFF’s highest-graded defensive lineman two straight years, putting up graded of 96.6 in 2015 and 95.6 in 2016. With the top quarterbacks gone, Donald can form the start of what could end up being a dominant defense to battle all those top passers that have already been drafted. There’s a definite trend here, with a string of defensive players coming after the string of quarterbacks. Mack’s 2016 grade of 93.9 was somehow the lowest of his career. He is the reigning Defensive Player of the Year. His 96 defensive pressures in 2016 were the most in the league by a full 10 over second place. The run on defense continues, but a year ago, Watt would likely have led off the group and pushed his way into the group of quarterbacks earlier than Bosa did this year. After a 2016 season in which he only played three games, though, after never missing a game before that, there are some previously unexpected questions surrounding Watt. Still, when healthy there aren’t many more dominant forces in the league, and reports are that he’s feeling good heading into 2017. In six years in the league, Miller has yet to put up a grade under 91.1, which seems pretty hard to fathom. He was the MVP of Super Bowl 50 and has been a five-time Pro Bowler. At this point, the strategy for this draft was pretty clear: Get yourself a strong, long-term quarterback, and if there wasn’t one available, grab a defensive stalwart. With J.J. Watt missing most of 2016, Clowney came into his own, showing the production the Texans had been expecting when they selected him first overall in the 2014 draft. His grade climbed to a career-best 87.2, and he was named one of PFF’s best defensive players under 25. If he can continue that in 2017 with Watt back and healthy, the Texans could have a ridiculous defense, but for these purposes, he’ll be anchoring a defense on his own. Concussions marred the end of Kuechly’s 2016 season — he’s missed nine games since the start of 2015 to head injuries — and raised questions about the remainder of his career, but he’s spent the offseason reassuring people he’s fine for the future. This pick has some obvious risk, because future head injuries could decidedly shorten Kuechly’s career, but he’s a two-time Defensive Player of the Year and a four-time Pro Bowler, so the potential rewards are obvious. After seven straight defensive picks, we’re back to the offensive side with Beckham. The star Giants receiver has actually seen his grade go down each season of his career, from 92.3 to 88.6 to 84.3, but he’s still topped 1,300 yards and 10 touchdowns each year. And he’s still only 24, meaning Beckham could keep his production up for a whole new generation of receivers. 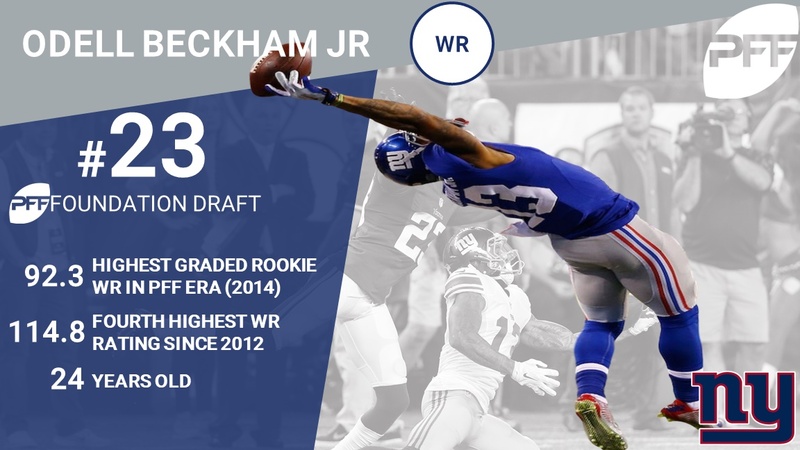 Starting a roster with Beckham is risky — you’ll need a quarterback later on who can get him the ball reliably — but then Eli Manning just finished a season as PFF’s 27th-graded quarterback and he managed to do the job. Garrett was the consensus No. 1 overall player in this year’s draft, and has the potential to slide up to the earlier group of edge defenders in the first defensive run. Still, he’s already had to deal with a foot injury before even starting his career, and he’s unproven, so relying on him to anchor an entire roster is counting on a lot from an inexperienced player. With the obvious elite NFL quarterbacks off the board, Rudolph joins Sam Darnold as college options taken as foundation players. Rudolph had an 86.7 grade in college in 2015, then followed that up with a 92.7 in 2016. He’s struggled with consistency in college, but when he’s been on, not many have been better. Evans finished 2016 as PFF’s second-highest-graded receiver, at 93.3. In his three years in the league, he’s averaged almost 1,200 receiving yards a year and had two different 12-touchdown seasons. He could use a complement in the receiving game — both in real life and in this draft — but even by himself Evans is a strong weapon, and he’s even younger than Beckham. Drafters who wanted to build around a quarterback this late in the first round had a quandary: Take a veteran near the end of his run (Philip Rivers, Ben Roethlisberger, etc. ); take a younger pro who might lack extreme upside (Andy Dalton, Ryan Tannehill), or go into the college ranks for a non-sure thing like Allen, who put up big plays in 2016 but also had plenty of negative plays. Still, he slots in after Sam Darnold and Mason Rudolph among college QBs, and if development goes well, he could be a long-term solution for a franchise who isn’t necessarily aiming for a 2017 title. Harris has graded at least 80.1 every year of his career, at least 85.3 the last five years, and at least 92.9 two of the last three seasons. He’s graded in the top 10 for five straight years. In a league where cornerbacks allow an average of 1.26 yards per coverage snap, Harris has been below 1.00 five straight years. We’re barely a month removed from calling Peterson the “standard-bearer” for shadow corners. Despite leading the league in coverage snaps against No. 1 receivers in 2016, he was targeted less often than any other corner and allowed receptions at the third-lowest rate. He’s 27 and, if there’s a knock on Peterson, it’s that he’s so strong in coverage that teams just look elsewhere. Still, he’s there to shut down at least one part of the opponent’s passing game. A 19-year-old with one year of college experience from a non-Power-5 conference as one of the top 30 foundation players in all of football? That’s how strong Oliver was as a freshman in 2016, when he became the first freshman ever to win the Bill Willis Trophy, given every year to the top defensive lineman in college. For the NFL, he won’t even be draft-eligible until the 2019 draft, but being able to grab him early for these purposes means a team has a potential defense anchor for a long, long time. Graham flies under the radar among the NFL’s top defenders, because he has only totaled 33 sacks across his seven seasons, with no more than seven in a given year. But Graham is a more complete package than a sack machine — he pressured quarterbacks 83 times in the regular season, the second-highest total in the league. If he can up his sack numbers even a little, he’ll start to be discussed among the league’s elite. The only offensive lineman to go in the first round of the draft, Smith has anchored one of the best offensive lines in the league for six years now, including an 85.9 overall grade in 2016 and a 95.0 in 2015. Considering the best this roster will be able to do is the 18th quarterback off the board, it might be smarter to just build a line and give that quarterback the best possible chance at maximizing his success. So that’s the first round. 32 players, 17 quarterbacks, 7 edge defenders, 2 each at defensive interior, wide receiver, and cornerback, 1 linebacker, 1 offensive tackle. Ed Oliver is 19, while Tom Brady, Drew Brees, Aaron Rodgers, and Matt Ryan are the only ones over 30. And interestingly, Tom Brady and Myles Garrett are the only players from their respective divisions (AFC East and AFC North) to be selected. The draft continues (Round 2 is about halfway finished), and we’ll be back to check on the progress later this offseason. But for now, who got their franchises off to a good start? And who made a mistake? Chime in on Twitter and let us know.